The aim of the conference is to register new knowledge and shape experiences about the latest achievements in cartography and GIS worldwide. At the same time, the focus is on the important European region - the Balkan Peninsula. The following topics are covered: User-friendly Internet and Web Cartography, User-oriented Map Design and Production, Context-oriented Cartographic Visualization, Map Interfaces for Volunteered Geographic Information, Sensing Technologies and their Integration with Maps, Cartography in Education. 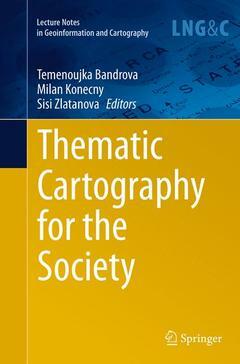 Focus on user-oriented cartographic approaches. User-Friendly Internet and Web Cartography.- Open Data Platform for Data Integration, Visualisation and Map Design.- A Web-Oriented Geoinformation System Application for Forest Fire Danger Prediction in Typical Forests of the Ukraine.- An Integrated Web Mapping Solution to Assess the Effect of SLR on the Northern Coast of EGYPT – EGSLR.- Heattile, a New Method for Heatmap Implementations for Mobile Web-based Cartographic Applications.- User-Oriented Map Design and Production.- Designing Simple and Complex Animated Maps for Users from Different Age Groups, Employing the Appropriate Selection of Static and Dynamic Visual and Sound Variables.- Optimising the Selection of a Number of Choropleth Map Classes.- Elaboration of the Technology for Development of Planning Freedom Maps Using GIS Tools.- The Solution of Massive Tasks in GIS Exemplified by Determining Terrain Surface Types above Gas Pipelines in the Czech Republic.- Approaches to Infrastructure Provision of Spatial Water-ecological Data on the Ob` River Basin Systems.- Cartography and Geovisualisation Techniques in the Exploratory Study of Geodiversity: Almeria Case Study.- The Geographical Size of a Country and Methods for Its Calculation and Mapping.- The Academic Atlas of Czech History.- Context-Oriented Cartographic Visualisation.- Cognitive Aspects of Geovisualisation: A Case Study of Active and Passive Exploration in a Virtual Environment.- Assessing the Completeness and Positional Accuracy of OpenStreetMap in China.- Combining Geographical and Social Dynamics in Dynamic 3D Environments.- Cartographic Symbols Depicting Ecoregion Properties.- Preparing Simplified 3D Scenes of Multiple LODs of Buildings in Urban Areas Based on a Raster Approach and Information Theory.- Quantification and Mapping of Flood Regulating Ecosystem Services in Different Watersheds – Case Studies in Bulgaria and Arizona, USA.- Sensing Technologies and their Integration with Maps.- Sensing Technologies and Their Integration with Maps: Mapping Landscape Heterogeneity by Satellite Imagery.- Analysis of Image Transformation and Land Use/Land Cover for Temperature Trends on Landsat Imagery.- Environmental Data Visualisation EnVIS – Linking Real-Time Sensor Data to Spatial Data Infrastructures for Web-Based Visualisation.- Cartographic Issues of Volunteer Mapping of Environmental Noise Using Mobile Phones.- Cartography in Education.- Maps of Mars Compiled by Students at Lomonosov Moscow State University.- The Use of Cartograms in School Cartography.- Cartography as Intentional Distortion.